CAPE CANAVERAL, Fla. - The future of Europe?s humanspaceflight program is riding on the successful Thursday launch of NASA?sshuttle Atlantis carrying the continent?s Columbus research laboratory,European space officials said Wednesday. Built for the European Space Agency (ESA), Columbus is theagency?s major contribution to the ISS and the lynchpin for Europe?s humanspaceflight endeavors. Columbus ?is our cornerstone, our baby, our module,our laboratory,? said Alan Thirkettle, the ESA?s space station program manager,in a briefing here at NASA?s Kennedy Space Center (KSC). ?What goes up tomorrowis anoperating laboratory. It doesn?t have to be outfitted. It?s all ready tostart work.? Weighing more than 13 tons, Columbus is set to launch with Atlantis? STS-122crew at 4:31 p.m. EST (2131 GMT) after more than 20 years of development.The lab is named after the Atlantic Ocean-crossing European explorerChristopher Columbus and has weathered delays first within the ESA, then by Russia as ISS construction began and NASA as the U.S. agency recovered from the 2003 Columbia tragedy. More than 750 ESA officials and supporters have traveled toKSC to bid adieu to the 23-foot (7-meter) long module, Thirkettle said. ?Tomorrow is a chance for Europeans, really, to share withpride in the joy and the triumph that we have developed,? he added. The lab is launching with five of 10 available science racksfilled - NASA will use the rest by agreement - but it isn?t the end of the ESA?sspace station contribution, ESA officials said. Early next year, the agencyplans to launch Jules Verne, the first of five Automated Transfer Vehicles (ATV)that will haul food, water and other vital supplies to the ISS. ?It?s like a big cylinder, but it has wings like a dragonfly,?ESA astronaut Jean-Francis Clervoy, the agency?s ATV senior advisor, said ofthe solar panel-powered, unmanned cargo ship. Built to launch atop European-built Ariane 5 rockets, ATV resupplyships are expected to ferry up to 5.5 tons of cargo to the ISS, as well freshwater, air and propellant supplies once Jules Verne?s planned 15-day shakedown cruiseis complete next February. To date, the ESA has spent some 5 billion Euros ($7 billion)on its ISS program contributions and expects to spend a total of 9 billionEuros (($13 billion) by 2015. That cost is spread across 10 of the 17 ESA membernations, Thirkettle said. ?Today, we?re doing wonderful things together,? saidThirkettle, adding that 60 years ago the continent was much more disparate. ?Seventeenmember states of Europe working together to produce spacecraft is somethingthat?s extremely important.? Together, Columbus and its ATV cargo ships make up the ESA?slargest commitments to the ISS. In return for building other ISS modules and hardware, Europe will be able to launch its own astronauts on six-month expeditions to the stationevery few years. VeteranFrench spaceflyer Leopold Eyharts, who will launch alongside German crewmateHans Schlegel aboard Atlantis on Thursday, is the agency?s second suchlong-duration astronaut and will join the station?s Expedition 16 crew when theSTS-122 crew departs. ?That?s very important for Europe,? said Thirkettle, adding thatEuropean long-duration astronauts are critical to boost interest in science andspace among the continent?s youth. ?We have to stay a high-tech continent.? Thirkettle said ESA officials hope to use its experiencewith the ISS to continue is human spaceflight beyond low-Earth orbit, withmeetings set for next year to determine the agency?s future steps. ?Europe is, historically, the exploring continent,? headded. ?I don?t think we?re going to give up now.? NASAwill broadcast Atlantis' STS-122 mission live on NASA TV. 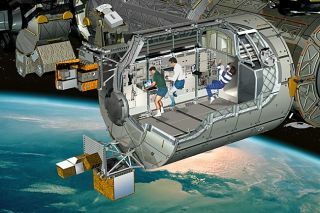 Click here for SPACE.com's shuttle mission coverage and NASATV feed.